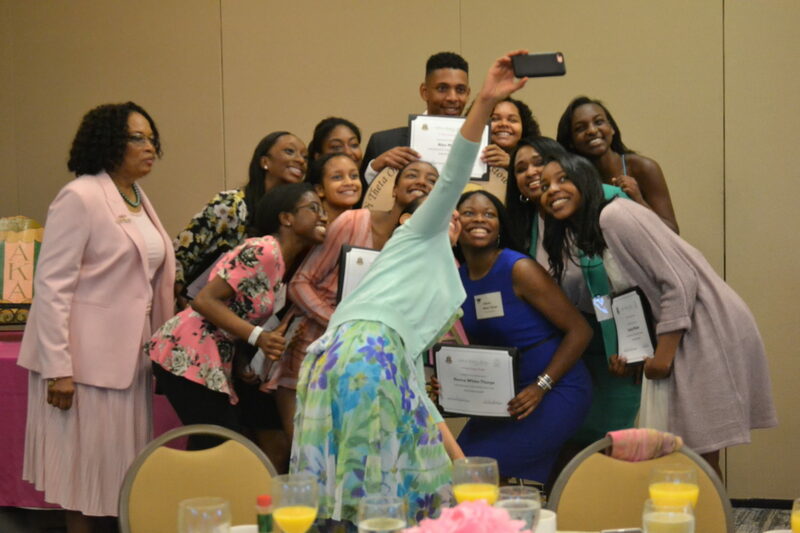 CBS News Anchor Michelle Miller poses for a selfie with Morris County scholarship winners at Alpha Kappa Alpha breakfast. Photo by Ally Tobler. CBS News Anchor Michelle Miller asked a group of Morris County high school students to raise their hands if they had ever failed. Eleven hands warily rose high. The hands belonged to winners of scholarships from the Pi Theta Omega chapter of Alpha Kappa Alpha, an international service organization with a local branch. The students were feted at a breakfast in Florham Park over the weekend. Miller, 49, is from Los Angeles but honed her skills as a news anchor in New Orleans. At CBS News, Miller has covered the 2004, 2008 and 2012 presidential elections, the death of Whitney Houston, and hurricanes Katrina, Irene and Sandy. Miller won a National Emmy Award in 2015 for a multi-platform series that followed a group of high school dropouts trying to turn their lives around. She encouraged scholarship recipients to persevere as they pursue their career goals. “I have made mistakes, big ones, huge mistakes,” said Miller, a graduate of Howard University and the University of New Orleans. Miller recounted her second job. She was 26. “I was rolling. I was at the number one station in Columbia, S.C.
“I was great that first month. Then I started to make mistakes on the air and everybody sees those. You start getting in your head and making more mistakes… I then made this big mistake where, without going into detail, the buck didn’t stop with me. I didn’t see something all the way through. After the child’s mother sued WIS-TV, Miller was fired from her anchor position. Halfway through an interview for her next job, Miller divulged her mishap. “I tell this story, because your integrity follows you through life,” she said. Miller’s story made an impression on scholarship recipient Nicole Williams, a Morristown High School senior who is bound for Princeton University. “I took away staying humble, being ready for any one of the setbacks I might be faced with, and understanding that even if I do have a plan, that plan might change,” Williams said. Miller applauded the AKA Pi Theta Omega chapter for “boosting young people” with scholarships at a time when “the educational system is devalued. Ifeoma White-Thorpe, who was accepted by all eight Ivy League schools and will study biology at Harvard University this fall, appreciates the sorority’s generosity. “They take a lot of the pressure off of students and it allocates more opportunities for them,” the Morris Hills High School student said of the scholarships. Other recipients are Kimberly Calloway of Morristown High School; Bailey Speight of Randolph High School; Grace Logan and Bria Pierce, both from Morris Hills High School; and Shadae Robinson of Roxbury High School. The Princess Anne E. Millard Scholarship, awarded to high-achieving Morris County seniors who intend to pursue studies in education or social sciences, went to Faith Fifo of Parsippany Hills High School. Students receiving Bookerships — scholarships for children of Pi Theta Omega chapter members — were Tayliour Martin (Morristown High School), Alex Malliet (Riverside Military Academy),and Sydney Winkler (West Essex Regional High School). The money for Bookerships comes from organization members; other scholarships are raised from the community. In all, $13,000 was distributed. Recipients will be furthering their education at Johns Hopkins, Montclair State and Temple universities, among other institutions. The scholarship application process was very competitive; recipients were chosen based on their grade-point average, community service, recommendations and personal essays, according to Dr. Diane Brown-Blair, a Pi Theta Omega member. Over the years, the chapter has given more than $180,000 to prospective college students. “The aim has always been to support children who were trying to get a higher education by going to a 4-year college,” said chapter President Aida Roberts-Bush, who will celebrate 30 years with the sorority next year. Established at Howard University in 1908, Alpha Kappa Alpha has 1,500 chapters and almost 300,000 members, from the U.S. to the Caribbean, Japan, Germany and Dubai. The Pi Theta Omega chapter was established in 1986 by 22 AKA members from the Morris County area. “Our mission is really to provide service to all mankind,” said Roberts-Bush. In addition to education, AKA causes include promoting public health with partners such as the American Heart Association, the National Alliance on Mental Illness and the Alzheimer’s Association. Alpha Kappa Alpha also works with the United Nations Association to teach children about the world. Community outreach is important to the Pi Theta Omega chapter. Gardening at the Morristown Neighborhood House and cleanup of nearby Cauldwell Park are among past service projects. The chapter also hosts monthly food drives for the Interfaith Food Pantry. Miller, who posed for a group selfie with scholarship winners, left them with one more piece of advice. “No matter how good you are, how brave you are, how brilliant you are, you are going to get knocked down. And that is certainly the biggest challenge of all,” the newswoman said. Nice information shared by you and thanks for sharing this useful information with us. We also want to draw your attention towards our scholarship named as “Course Hero Academic Hero Scholarship”. The deadline is June 30, 2017. Anyone 16 years of age or older who either plans to attend or is currently attending an accredited college or university can apply for the scholarship.